Got a call from my chair yesterday that he wanted to try to have a late afternoon meeting on Skype with another (new) colleague. Anyone who lives with a pre-schooler knows that is just about the witching hour when you can’t be sure if you’ll be in the company of Dr. Jekyl or Mr. Hyde. Some quick planning was in order. I took a cue from TinkerLab and set up an “invitation” for Crafty Cora to try to engage her in some quiet and creative play while I was in my meeting. It worked like a charm. She came into the room, took one look at the table I set up, and got busy. The next time you need your little one to keep herself occupied while you are otherwise engaged, consider taking a few minutes to “set the table” for her to occupy herself. 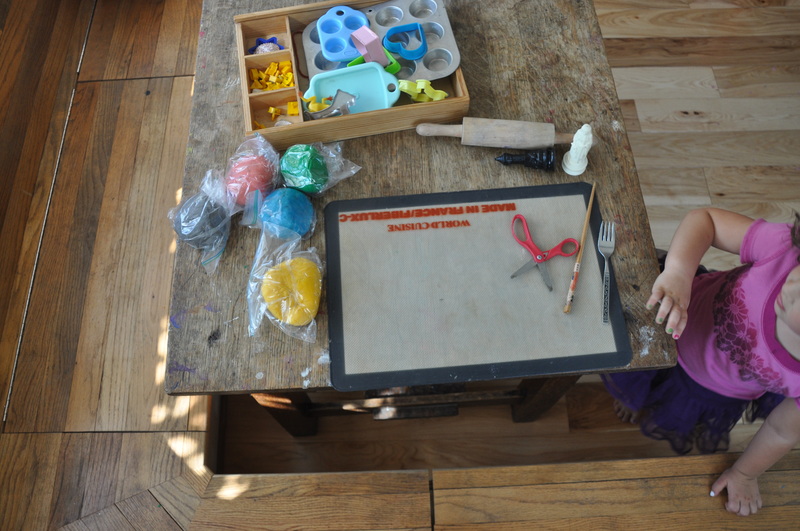 This entry was posted in Crafty Cora, Teaching Art Education Online and tagged Art of Young Children, Artful Home, Creative Distraction, Invitation to Creativity, Material Exploration, Mommy time, Parenting, Play dough station, Tinkerlab, Working from Home by jodiK. Bookmark the permalink. I LOVE this post! As I read this I had to smile because on many occasions I did the same thing, during my work with UF. Glad you saw it, Danelle. Definitely part of my attempts to create an “artful home,” as you wrote about in your capstone. Your work is seriously fabulous, Rachelle.